We've spent the last month or two lavishing praise upon the month of May. Sure, May is usually a hotbed for quality summer releases, but that doesn't mean the rest of the year should be ignored. So for this (once again abbreviated) 11 Best, we'll be highlighting songs and albums that put the other eleven months in the musical spotlight. "January Wedding" - One of the standouts from I & Love & You, the Seth-penned tune gives Avetts fans everywhere a reason to start the year off with a wedding. "Feb 14" - It's not the best DBT's song. Hell, it's actually one of my least favorite Truckers songs. But there just aren't that many written about this month, and so here we are. March 16-20, 1992 - Not a song, but an entire album named after the month of its conception. As I've written before, it's one of Uncle Tupelo's best and it's essential listening for any fan of Americana. April - Another album nod, Sun Kil Moon had the unenviable task of following up a masterpiece. But April made good on expectations and has aged into another Mark Kozelek standout. "June's Foreign Spell" - This and the other tracks on A Series of Sneaks reminds us the Spoon was a rowdy alt-rock band before they were a rhythmic indie-mainstays. "July, July!" - The Decemberists offer a wealth of songs with months as names (not to mention the band's name itself), but none get you going quite like "July, July!" "St. Augustine" - Cut me some slack here, but at least August is somewhere in the title, plus it's the pretty little number that closes out one of my favorite albums in Everything All the Time. "September Gurls" - Big Star's Alex Chilton passed away last year, he left behind one of the more celebrated catalogs among musicians. He also provided the perfect entry to this list. "Waiting For October" - Mark Mulcahy's pseudo-group "Polaris" is best known for writing the memorable theme and a few other songs for "The Adventures of Pete and Pete" on Nickelodeon. This might be the best of the bunch. "November" - Of course Tom Waits would write a creepy song about the month when everything starts dying. "December" - Let's round it out with some 90's comfort food, the driving Collective Soul number that still brings me back to a time when...well, when Collective Soul was popular. Lest this blog be labeled "monthist", there you have it. Hopefully in June I'll get back to the standard five-post format of this feature, now that the MAYhem has subsided. Thanks for following along, in this and all months. The top 11 lists are fantastic. Keep up the great blog! Justin, thanks so much for contributing... That's quite a daunting task you've laid out, your ambition is impressive. I was spread thin for a few of these months...let me know if you find anything else. Have you considered doing an 11 list of your favorite covers? I'd be interested in your suggestions. Woo boy...that's quite a task. I'd be interested to see your list. 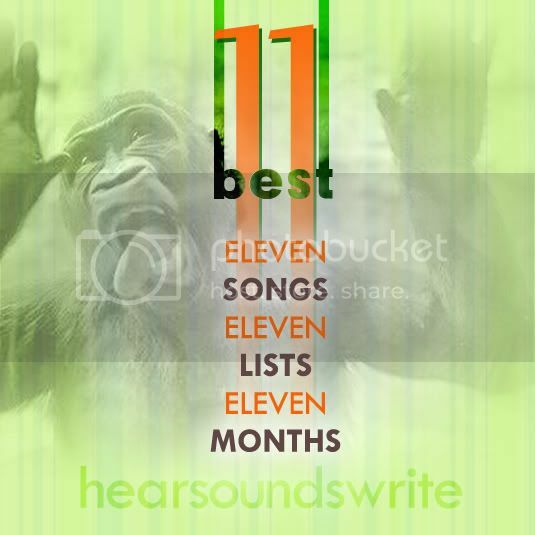 And yeah I was thinking of doing an 11 Best Covers at some point...maybe I'll do it in June?